Guess what has arrived, that’s right the brand new Jillibean Soup Collections from the winter 2016 release! 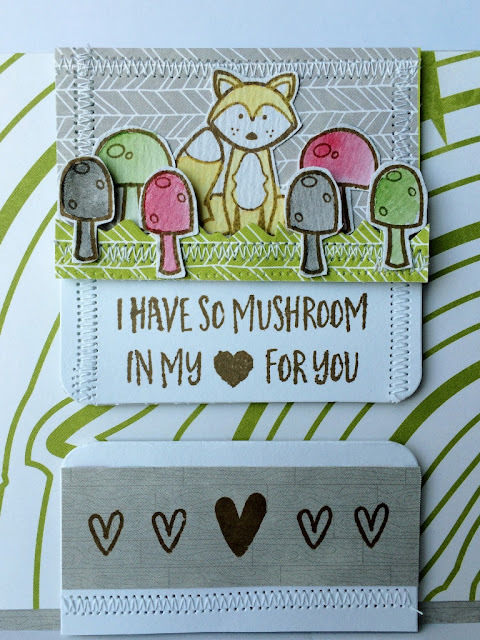 Which just happens to include the Mushroom Medley Collection and this adorable stamp set. The card base is a 5” x 7” white card stock. Then I chose the gray brick background and the large woodgrain pattern as a mat. Using brown ink I stamped the mushrooms and fox onto watercolor paper and set aside to dry completely. Once dry I pulled out my watercolor paints and painted in the designs. Then set aside to dry again. Next I fussy cut them out of the watercolor paper. Then using a Studio G mini card I built the middle panels adding the gray arrow print and green arrow print for grass as shown. Then I stitched them using my sewing machine to add some texture. The green grass was then added to panel with 3D pop dots and next I layered on the fox and mushrooms as shown. 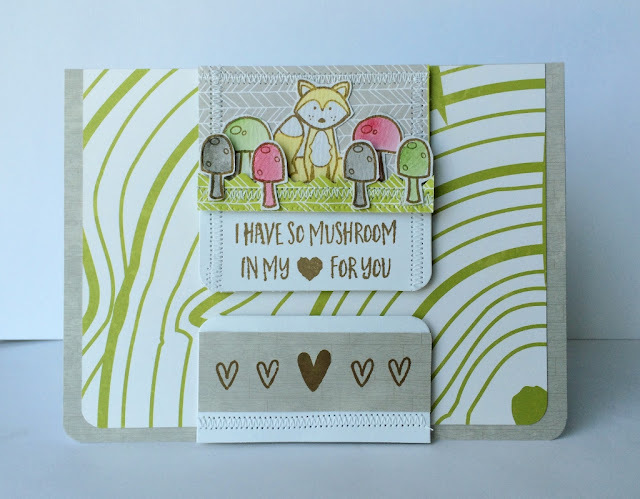 Using 3d pop up dots for the top of the front mushrooms. Then I stamped the sentiment in brown ink onto the bottom of the top panel. Cutting apart the mini card I created the bottom center panel and added a row of stitching across the bottom. Then I stamped the hearts in brown ink onto the gray brick pattern paper as shown and adhered to the bottom panel piece. Both center panel pieces were added to the card front with 3D pop up dots. I love how this one turned out, suitable for either a boy or a girl and for several different occasion possibilities.